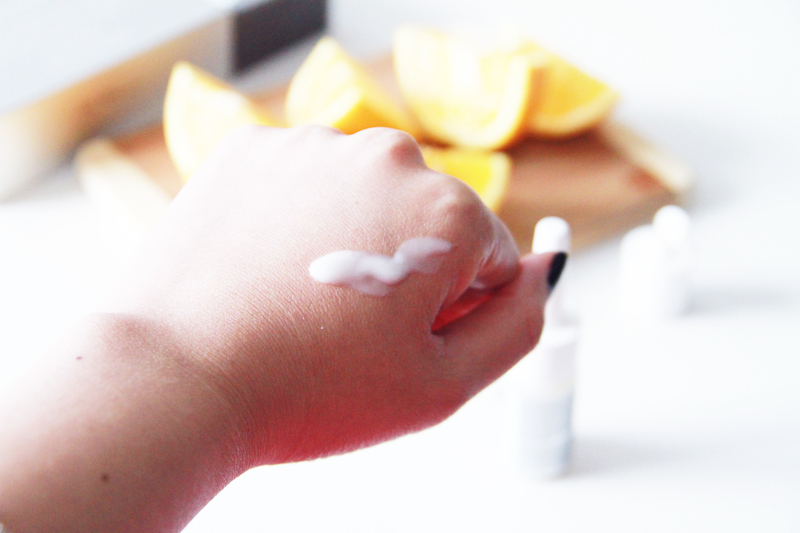 Why Vitamin C is so important for your skin? Since I was little, my mom has always reminded me to eat a lot of fruits that packed of vitamin C and said that it would help me to achieve flawless skin when I grow up. I wasn’t a big fan of citrus when I was young so I never really took her advice to heart until I got a bit older and hit puberty and faced what most of teenagers had to deal with at the time, acne and pimples. I used to have so much pimples that at some point, my skin was a major roadblock to my confidence. I remember being taken to many dermatologists by my mom but none of the topical treatments and medication at the time worked. Some people told me the problem would disappear once I hit 20 or so and I only needed to put up with it for a couple more years. The bad news was, I continuously had to deal with this problem for a good 14 years, which then turned me into a acne-prone skin expert from all of the research that I have found myself on the internet and thousands of dollars that I have spent on all acne treatments and products. Throughout these years, I finally realized how important vitamin C is to our skin and how to treat acne prone skin correctly. Vitamin C is full of powerful antioxidant properties (also known as L-ascorbic acid). It ensures the healthy growth of all the cells in your body including strengthen your immune system and skin health. Its role in collagen synthesis makes vitamin C a vital molecule for your skin. As we age, the process of synthesizing collagen of your body also slows down and that’s when vitamin C comes in and helps with the process. 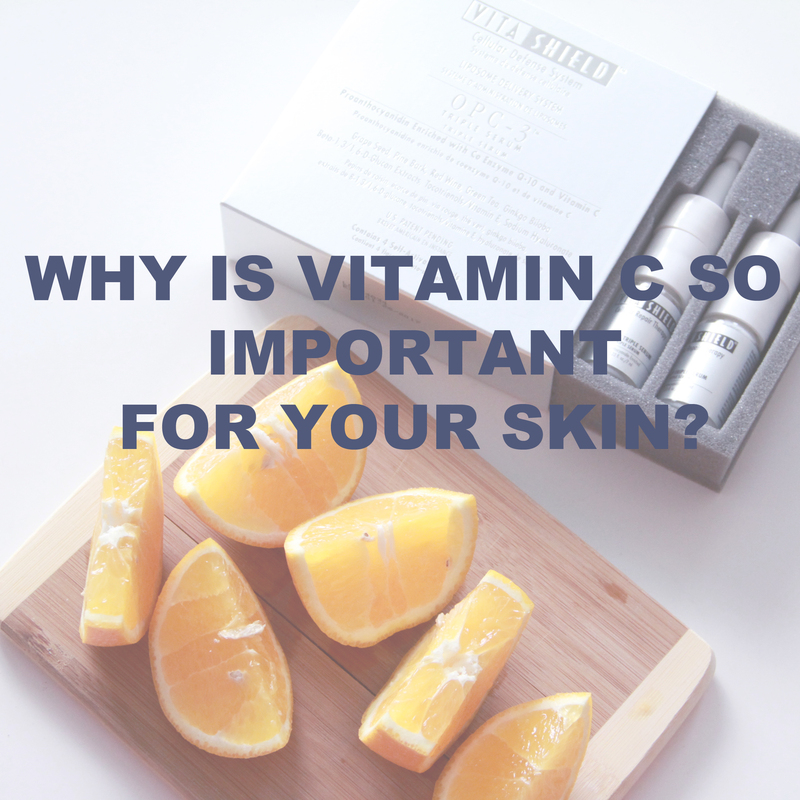 Why is vitamin C important to your skin and more specifically, acne prone skin? 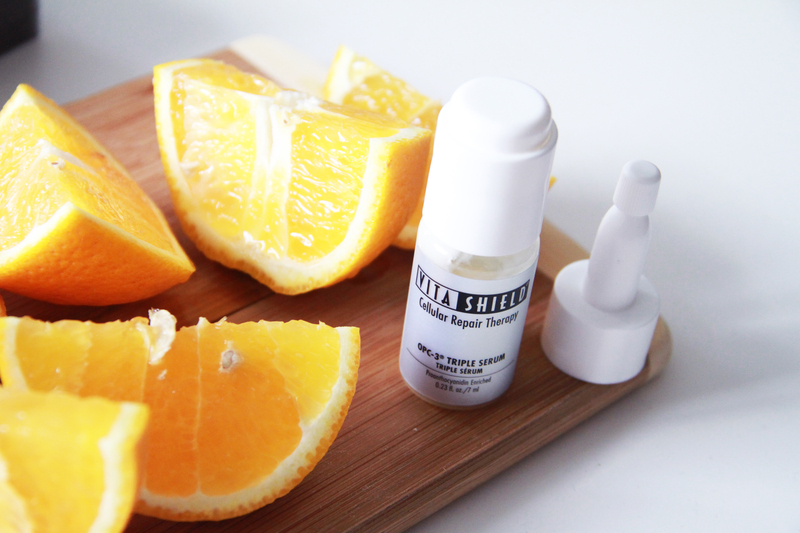 Vitamin C is vital to the health of your skin. Without vitamin C’s help to make sure your body synthesizes collagen properly, you will experience a lot of skin problems. Acne is one of them. Vitamin C not only helps your skin to stay healthy but also has brightening and revitalizing benefits, which is extremely beneficial for people who have acne skin like mine because we have to deal with dark spots and stubborn acne scars. Unfortunately, there are a lot of products out there that claim to provide the solutions to our problems but only a few can deliver. 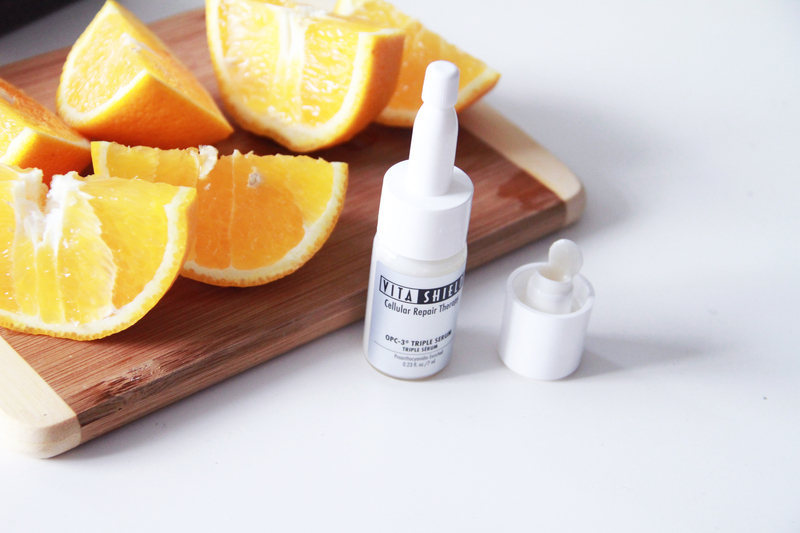 Not a lot of skincare brands out there can have the ability to produce pure 100% vitamin C because it’s often expensive and has really short shelf life as 100% vitamin C oxidizes a lot faster but this is the good type of vitamin C that would want to get your hand on. Where can you find 100% Vitamin C? 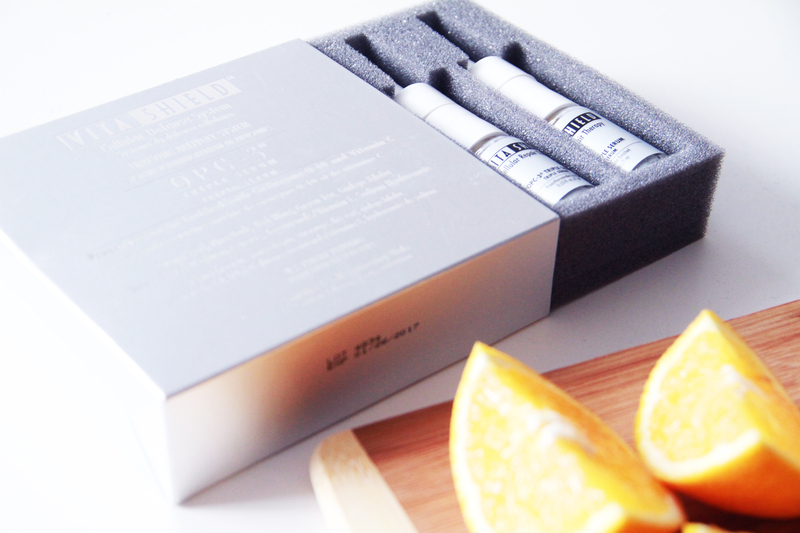 After a few years of searching and trying out many products in the market, I finally found a product that does not only contain vitamin C but also OPC-3, a super antioxidant ingredient that is so powerful that together, they can even tackle more serious skin problems such as deep wrinkles, severe acne and permanent acne scars. The good thing is, there is no harsh chemicals in the products to intend to treat acne. Because of the strong antioxidants benefits, this product helps protect your skin from free radicals and environmental damages with all the best natural ingredients such as grape seed extract, pine bark, green tea extract, ginkgo biloba, vitamin E and co Q10. 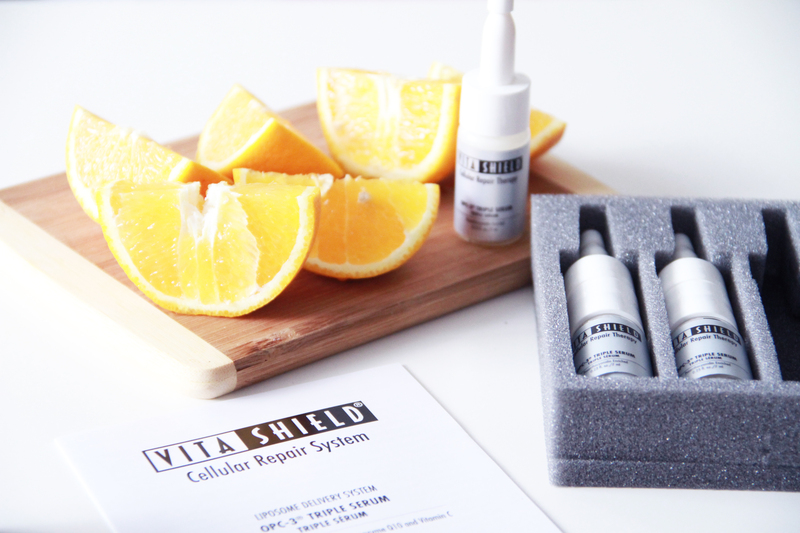 The product is called VITASHIELD, you can read more FAQs on the product and reviews from other people HERE. 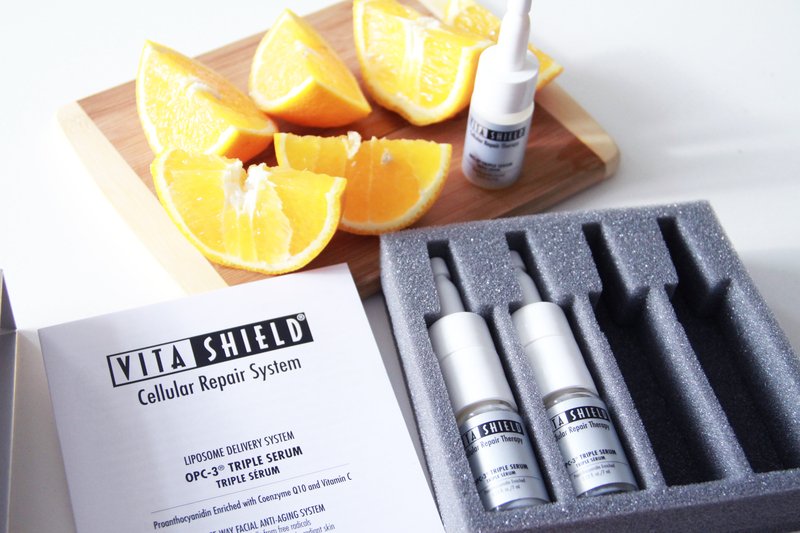 VITASHIELD comes in a small pretty box like this. The price is super affordable compared to the rest of the similar products I found out there. For the same quality of products, you would probably pay 3-4 times more with other brands. There are 4 small bottles of in a box. Sorry I already finished my first bottle because I wanted to wait to see the results first before blogging about this product. You are advised to finish a bottle within 10-12 days to benefit the full amount of this powerful combination. A bottle looks like this and if you can see, the top cap contains pure vitamin C that is only released when you decide to open the bottle. All you have to do is to press that cap on top to release all the vitamin C powder into the bottle and shake well. Next step is to replace the cap with the dispenser that comes with each bottle and you can start using it. To be honest, this whole fancy process really makes me want to finish the bottle as fast as I can to repeat this step ha ha. 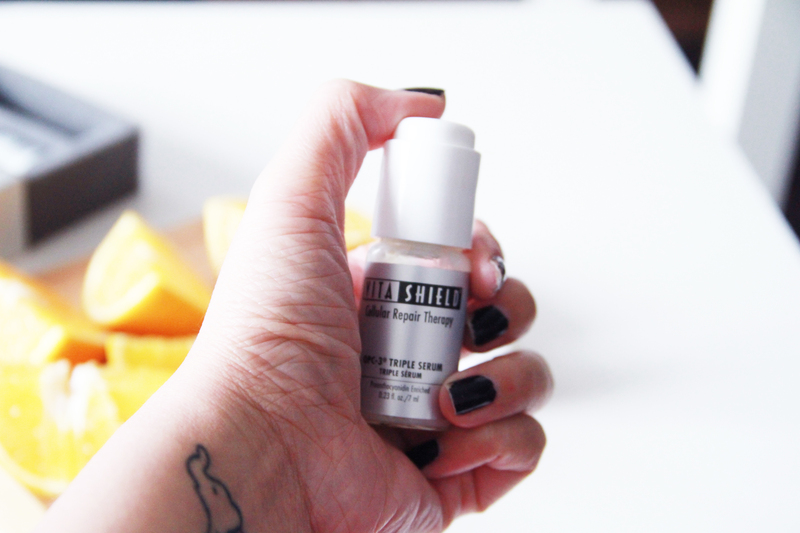 The serum is super thin and quick to absorb. It smells a bit citrus. I just can’t describe or compare the smell to anything else out there. It’s pretty pleasant tho. 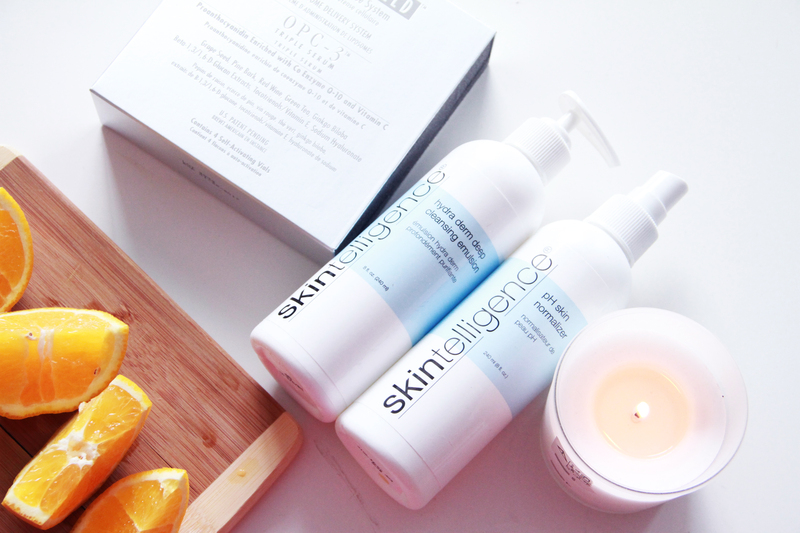 On the box’s instruction, it is suggested that we use the two following Skintelligence cleanser and toner together with this serum for better results so I also purchased them. However, I will do a separate review on these two some time in the future because they are both amazing products. If you are thinking of trying out this product, CLICK THIS LINK HERE! For the two weeks that I used the first bottle, my skin has gone through a huge transformation. The first couple of days, I did break out a little and I heard it was only because the product was detoxing your skin and pushing all the bad stuff out of the system but from day 3 onwards, the result has been amazing. My dark spots and scars also disappeared and faded tremendously. If you apply the serum on your skin before make up, at the end of the day, when you take off your makeup, your skin will also feel amazing. How I noticed the improvement in my skin is the fact that before using this product, any time my diet went bad (eating fried food and fast food or too much coffee and sugar), I will experience break out but I have been on a pretty unhealthy diet (Oops!) when I was using this product and so far, it has been no concerns. I also have had people commenting on how clear and glowing my skin looks. I really hope this product can give you the same result as it did for me.